People who take down a statue, saying they no longer have any use for that icon, are filled with an intense hatred for the past. A bust of B.R. 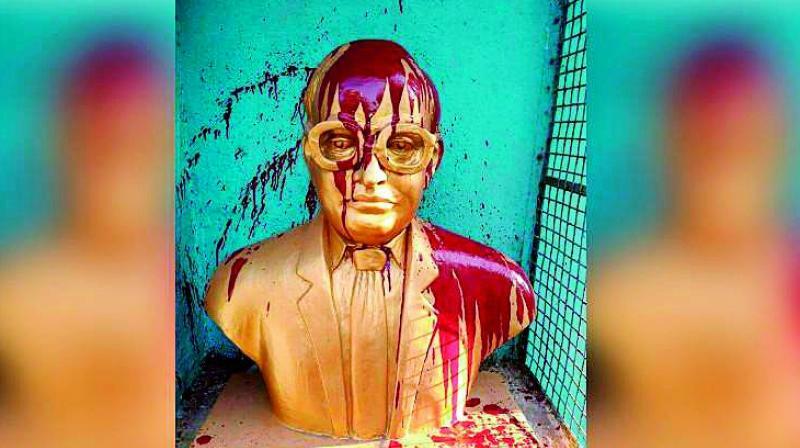 Ambedkar desecrated at Tiruvottiyur in Chennai. During collective uprisings, previously revered statues are demolished. 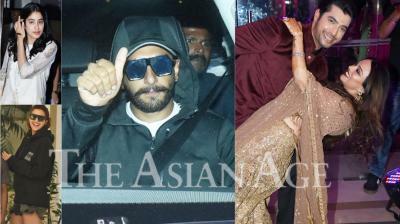 Whether shock and horror, or jubilation and joy, depends on which side of the ideological divide one is. The very space inhabited by the statue (or the wall) is now left open for new interpretations, where ideologues define their sense of certainty about what will replace the demolition. Because Gorbachev made the world ready for a new dispensation, Lenin toppled, and in time the Berlin wall gave way to a mall at Checkpoint Charlie. What had been marked by secrecy and State oppressiveness now became a shopping mall, which communicated the presence of a Liberal economy. ISIS has been active all over the Arab world destroying the signs of past civilisations. The fundamentalism of theologies which seeks to destroy the Other, and the fall of the symbols and mnemonics of alternative civilisations and cultures, are known through history. In India, the destruction of the Babri Masjid was supplemented by TV images of people who felt that they had a cause, a symbol of oppression that must be demolished. ISIS draws people in through a variety of proselytisation, returning people to the 7th century, while co-existing with modern technology, including bombs and aeroplanes. The loss of the Buddha of Bamiyan in Afghanistan is still very apparent to us. The past is always vividly around us, and the new demagogues and fundamentalists of every religion see this as problematic. To demolish a statue or a building is to destroy evidence of its daily presence. When people take down a statue, they are saying they no longer have any use for this icon, or for that particular memorial. They are filled with an intense hatred for the past, which stands for them, for a particular kind of tyranny. They feel that the statue ties them down to something which they are ashamed of. When King George V’s statue was toppled at India Gate in New Delhi, it lay there for a while, but Gandhi’s statue did not replace it. It is possible for a vandalised site to be reconstructed. Berlin after the war has been reconstructed inch by inch, and the 19th century buildings have been reduplicated. Even today, the cranes are to be seen everywhere in Berlin, as mimetically, a historical city is re-fabricated. Back home, K K Mohammad, formerly of the Archaeological Society of India, has been responsible for piecing together monuments and statues which have fallen to ruin over time, or because of the excesses of visitors and lovers who desecrate sites When crowds collect with a purpose, they are more intensely focused on the task at hand, whether it is lopping off statues, or breaking down constructions. Spaces are permeated by the memory of the past. When we inhabit a space we live in its aura of memories crystallised in its buildings and monuments. When a place is allowed to collapse, the statues also go. We visit ancient sites for purposes of education and tourism, and we find, for example, that the Buddhas that ornamented viharas, now have their noses broken, as do gods and goddesses of an earlier time. Any visit to a museum for instance would show that the sacrilege, desecration and loss are huge. People do not just demolish statues for political reasons, neglect by the State and local communities also leads to desecration and abuse. Many of Tamil Nadu’s ancient temples were used as living or commercial spaces, and, the interior spaces of these temples, often a thousand years and older, were completely ruined. It is the same with Mughal buildings when they are not taken over by the Archaeological Society, or Hindu temples in Kerala where stainless steel pillars may have replaced wooden ones during temple renovation. Times have changed. What excites is community feasting, pilgrimage, warfare and marking the “enemy”. Vandalism becomes a sport; it could be a church, a mosque, tribal or lower caste hamlets with their animistic representations. The police force becomes part of the ritualistic fervour of believers, and at the lowest level crushes all those who think or feel differently. So when Ambedkar, Gandhi or Periyar’s statues are demolished, police stand aloof from the destruction, as they share the same ideology of those who march forward to new ideological goals, new visions, new worlds. Marches for Human Rights and Women’s Equality and Safety meet the same fate. The demolition of statues need not always be for a political cause. Fr Ignatius Payapally, the archivist of the Indian Institute of Science, Bengaluru, has spent many years protecting manuscripts and buildings. He writes letters to parishes that have demolished ancient churches, and thrown archaeologically valuable evidence to the forces of Nature, such as stone crosses, epigraphic materials and statues which now lie in the sun. To move towards a respect for the past is a very hard task, requiring specialised educational motivation and institutional respect. Relics of the past are valuable because they show us how vulnerable human beings are to war, human emotions and natural disaster.